Does the following scenario sound familiar to you? You are a software developer and you are tasked with developing interactive (Gantt) charts to help your users better understand and work with your time-related, resource-oriented planning and scheduling data. You have already screened the market for some Gantt chart controls and finally have decided to test one or two. You have chosen one for downloading a trial version ... and now you are wondering how to start and how to achieve a meaningful Gantt chart as soon as possible. Of course, time is an issue and your boss is pushing for fast results. This blog post is the first of a series of articles addressing software developers who are facing this challenge and who have decided on also testing our Gantt chart control VARCHART XGantt (either as .NET, ASP.NET or ActiveX version). Of course, we start with the obvious: how to install our component and get started with XGantt. To develop an application on the basis of .NET you need a development environment such as Microsoft Visual Studio 2010 upwards supporting the .NET framework 2.0 at least and being compatible with mixed-mode .NET components. Only the 32bit or 64bit (x64) editions of Windows from XP Service Pack 3 upwards can be used as operating system. Server 2003, Vista, Windows 7 or Windows 8. If not done yet, download the Gantt chart control VARCHART XGantt from our website.Then please start the setup program and follow the instructions given there. After the installation you should add the control to the toolbox of your respective developing environment. In Visual Studio create a new project of the type Windows Application or ASP.NET Web Application. It doesn't matter which language you choose but please mind that the toolbox be visible. If it is not, click on View Toolbox. Open the context menu by a right mouse click on the toolbox and select Choose Items. By clicking on Browse of the .NET Framework Components tab you can choose the assembly NETRONIC.XGantt.dll from the installation directory. After confirming by OK the icon of VARCHART XGantt .NET / VARCHART XGantt ASP.NET will be added to the toolbox. The specified paths certainly depend on the settings of your computer. The installation procedure is logged to the file install.log allowing for tracing where files were copied. The same file will be used for uninstalling. You can start the uninstalling procedure by selecting Start -> Settings -> Control Panel and then Add/Remove Programs. start/wait (NameOfTheSetupFile).exe /L1033 /s /V"/qn ADDLOCAL=ALL"
The invoking procedure, like a DOS box for instance, needs to be run with admini­strator privileges; otherwise a UAC message may appear requesting a user entry. Language parameters: /L1033: installation in English; /L1031: installation in German. Progress information: /qb: progress information will be displayed; /qn: no progress information will appear; in other words, you won't see anything on the screen. ‘Start/wait’ should be used in case the installation is run by a batch file or else the batch file will run on parallel to the installation. Together with the VARCHART XGantt control, our "sample collection" will be installed. This happens automatically when installing the .NET and ActiveX Edition. This sample collection provides a very good starting point for developers as it consists of some Gantt chart application templates including their source code. This means: You can take one of these templates, open the code and start from there. You can access the sample collection by clicking on the respective symbol on your desktop. To run a sample, mark it in the list and click the according button . To view the source code or the current configuration of XGantt on the property pages, click . The source code can, however, always be viewed in text mode on the Source Code tab. Car Rental: Leasing orders for vehicles are scheduled and managed. Control Center 2: You can allocate production orders to grouped machines. The orders are stored in a Microsoft Access data base. Production Planning: A classic production planning template. Reservation Planner 2. Manage training rooms and trainers for seminars and have conflicts visualized graphically. Shift Plan: Assign different shifts to your employees. 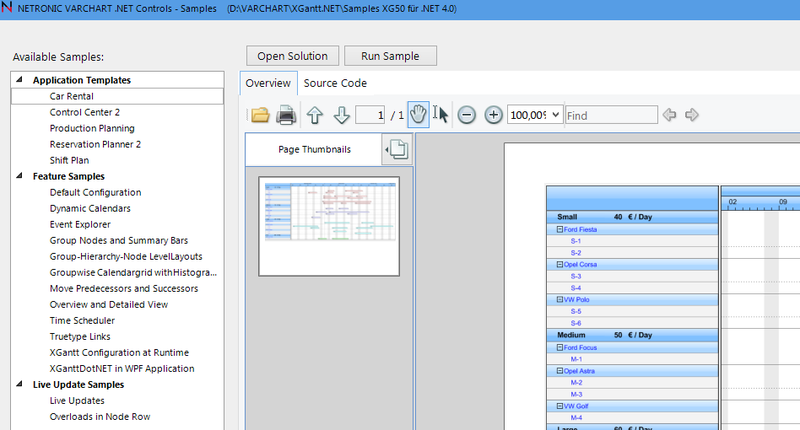 The group Feature Samples presents some showcase features of XGantt. The examples of the Live Update Samples illustrate how the consequences of a mouse interaction are being visualized immediately during the action and not only upon ending it.